In general, the Master Plan identifies opportunities for improved circulation and access to the Park. A hierarchal path system is planned that designates primary and secondary trails. The main entrance of the park is planned off of Mill Street while a secondary vehicle access point is proposed off Reist Street. Developing opportunities for nature and cultural interpretation throughout the Park is also proposed. 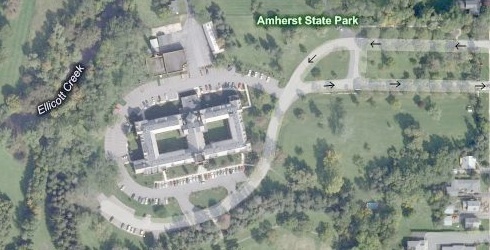 A .pdf file of the Amherst State Park Master Plan and EIS is available for download. 1) Northern Area - The irregular shaped Northern area is defined on the north by Sheridan Drive; on the east by existing residential properties and the Holy Family Home; on the south by the Mother House property; and on the west by Ellicott Creek, private residences, and the Hutchinson Hose Company, Inc. (volunteer fire company). The area is generally flat and includes a combination of lawn and woodland habitat. It is proposed that this area remain unprogrammed and be maintained as open green space. Activities that have historically occurred there will be allowed to continue. The plan also recommends the sale or transfer of the property at 508 Mill Street, the narrow residential lot south of Arty Drive. 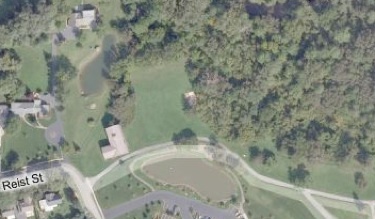 2) Mother House Area - The Mother House area is at the central core of the park. The area is defined on the north by the Holy Family Home; on the east by Mill Street; and on the south and west by the floodplain of Ellicott Creek. It is proposed that the main park entrance occur in this area. The Master Plan proposes to reconfigure the two existing roadways from Mill Street from two-way roads to one-way roads, the northerly road becoming the entrance to the State Park, Holy Family Home and St. Mary’s Commons (the proposed senior housing development at the Mother House) and the southerly road becoming the exit. Two new segments of road will be constructed, one a one-way segment extending the proposed entrance road from the Holy Family Home entrance to the St. Mary’s Commons property, and a second two-way road segment that will provide the Holy Family Home access to and from the proposed exit road to Mill Street. This new road connection allows for one common entrance and exit for park visitors, Holy Family Home residents and employees, and for the future occupants of the Mother House. The two-lane road also allows two-way traffic between the Holy Family Home and the main parking lot. Access to the primary trail system will also occur in this area. Additional proposed development in this area includes a designated parking area for approximately 25 vehicles, a restroom building, an information kiosk, restoration of an existing gazebo, and a playground. The existing Mother House garage is proposed as a park maintenance building. A garden area that could be maintained by a local garden club and residents of the adjacent Holy Family Home is proposed on the east side of the maintenance building. It is proposed that the lawn area south of the one-way exit road be maintained for passive activities and as a venue for small-scale events. 3) Creek Bend Area - The Creek Bend area is located within the 100-year floodplain of Ellicott Creek, immediately west of the Mother House area. The area is defined on the north by the upland terrace of the Northern area; on the east by the upland terrace of the Mother House; on the south by the Orchard Area; and on the west by Ellicott Creek. The proposed primary north/south pathway passes through the west side of this area. A one-lane road is proposed (using an existing gravel lane) for handicap access to the creek (including parking for 2 vehicles). Additional elements proposed for this area include picnic tables, the restoration of the stone steps that climb up to the Mother House area, a small overlook/landing near the top of the stone steps to provide views of the Creek and stabilization of the Creek shoreline. 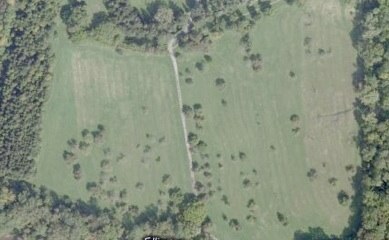 4) Orchard Area - The Orchard area currently consists of an abandoned apple orchard, open field, and conifer plantation, which occur within the 100-year floodplain of Ellicott Creek. 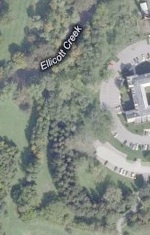 The area is defined on the north by the upland terrace of the Mother House; on the east by private residential properties fronting on Mill Street; on the south by the deciduous woodland encompassing Ellicott Creek; and on the west by Ellicott Creek. Proposed improvements include the maintenance and reestablishment of the orchard. This would involve removal of dead and dying trees and supplementing the existing trees with new plantings of apple trees and/or other fruit trees. Secondary pathways are proposed around the field. The primary north/south path is proposed to follow the existing gravel access road that runs through the center of the area. A garden area and picnic tables are proposed at the north end of this area, at the bottom of the stone steps leading to the Mother House area. 5) Ellicott Creek Area - The Ellicott Creek area consists of nearly the entire southern half of the park. Most of this area is woodland and falls within the creek's floodway and 100-year floodplain boundaries. The area is defined on the north by the Orchard area; on the east by residential properties, the Village Glen Tennis and Fitness Club, and Glen Park; on the south by Glen Avenue; and on the west by open floodplain vegetation and residential properties on North Cayuga Road and Mill Race Court. The primary north/south path is proposed to continue along on the eastern side of the creek. The trail will be located so as to minimize disturbance to existing vegetation and avoid areas subject to the full force of floodwaters. A pedestrian entrance to the park and a trailhead for the primary north/south path is proposed on the north side of Glen Avenue (adjacent to, but set back from Glen Avenue). Seating areas and interpretative signage are proposed adjacent to the pathway and near the creek edge. Fishing access will also be allowed. In the area immediately south of the Orchard area, secondary pathways are proposed along both sides of the creek. To the extent possible these pathways will follow existing informal trails that currently exist. 6) Floodplain Area - The Floodplain area is located east of the Reist Mill area and is part of a larger area of low-lying fields and wetlands west of Ellicott Creek identified as a potential park expansion opportunity. The area is defined on the north and east by the Ellicott Creek floodway; on the south and west by the elevated uplands surrounding the Reist Mill. It is proposed that the primary east/west path system cross through this area. Sections of elevated boardwalk will need to be installed to cross wetlands and a small stream that runs along the west edge of the area. Interpretive signage and educational opportunities regarding wetlands and floodplains would be appropriate along this path. A secondary path is proposed along the south edge of Ellicott Creek to the Reist Mill. 7) Reist Mill Area - The Reist Mill area is located on the west side of the park and offers a point of entrance to the Park for local residents to the west. The area is defined on the north and east by the Floodplain area; on the south by the new Mother House property; and on the west by a private residence across Reist Street. The Reist Mill is a local historic landmark that has the potential for adaptive re-use and historic interpretation. A lawn area surrounding the structure is also part of this area. The primary east/west pathway is proposed to start/end at Reist Street. The Master Plan recommends stabilization of the Reist Mill. Parking for three vehicles is also proposed for this area to accommodate local traffic, handicapped visitors, and future program development at the Reist Mill.